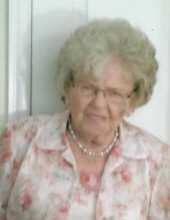 DURHAM: Gladys Clark Cherry, 89, passed away on Wednesday, January 16, 2019 at Durham Ridge Assisted Living. She was born in Durham, the daughter of the late Hoyt Neal Clark and Ethel Lillian Williams Clark. In addition to her parents, Ms. Cherry was also predeceased by her husband, Paul Watts Cherry. Ms. Cherry was a retired cook with Durham County Schools. Ms. Cherry is survived by her daughters, Deborah Overton (Terry), Gwen Utley (Sandy Lloyd), Linda Self (Gerald); son, Ronald W. Upchurch; brother, Horace Clark; sister, Joyce Cox; 8 grandchildren; 20 great-grandchildren; and 2 great-great-grandchildren. A graveside service will be held 11 a.m., Friday, January 18th, at Oak Grove Memorial Gardens with Pastor Earl Echols officiating. The family will receive friends from 6 to 8 p.m. on Thursday, January 17th at Clements Funeral Home in Durham. To send flowers or a remembrance gift to the family of Gladys Clark Cherry, please visit our Tribute Store. "Email Address" would like to share the life celebration of Gladys Clark Cherry. Click on the "link" to go to share a favorite memory or leave a condolence message for the family.